Visit to the fairyland of an underground kingdom. The magic landscape of stalactites, stalagmites and stone pillars in various forms from animals and plants to the castles…. Fantastically illuminated boosts your imagination beyond the limits of reality. The story behind the name of the Reed Flute Cave is quite prosaic. It comes from the thriving reeds at its mouth used by local people to make flutes. Do not take me wrong however because the cave itself in its richness of forms and shapes skillfully illuminated by colorful lights is far from being prosaic. It is a spectacular underground world created by million of years of carbonate deposition. Walking through the 240 meters long labyrinth of caves you are astonished by the lavishness of nature expressed by stone pillars, stalagmites and stalactites – it is the real feast for the eyes and paradise for imagination. Along the way our guide provides the names for most stone formations – either born from legends or out of humans’ romantic needs. Indeed, most names are very poetic – Crystal Palace, Virgin Forest, Fruit Mountain, Mushroom Hill, Dragon Pagoda, Red Rose … to name only few. Incredible shape and colors of the blooming Red Rose. But the truth is that all these fantastic creations of nature nourish feelings, perceptions and shape views with our own versions of likeness and possible names. Personally I “christened” there Heavenly Organs thinking for a while about a spectrum of musical tones they could release if touched by the magic hands……. Dosn't it look like an undersea coral reefs world and a jellyfish with the gigantic tentacles? How can we stay untouched by this fascinating scenery? Crystal Palace in its raw beauty. Nature also needed some help - artificial lights and human hands opened for us this otherwise world of darkness. But I'm sure that the Mother Nature does not want to jealously keep all her secrets. 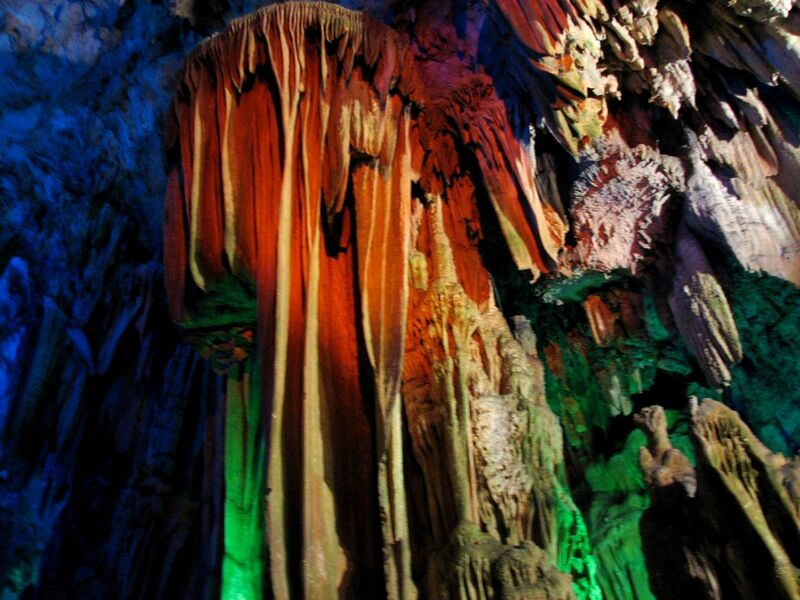 I know you will agree – the Guilin Caves presented one of the most fascinating tours of the underground world. Vibrant colors, amazing shapes and forms, power of raw nature – all that forced us to take a deep breath and think at least a bit about how gracious should we be to the Mother Nature. She was patiently making for us this beauty over millions of years and finally offered for free in its unspoiled form. Who else will do it this way? 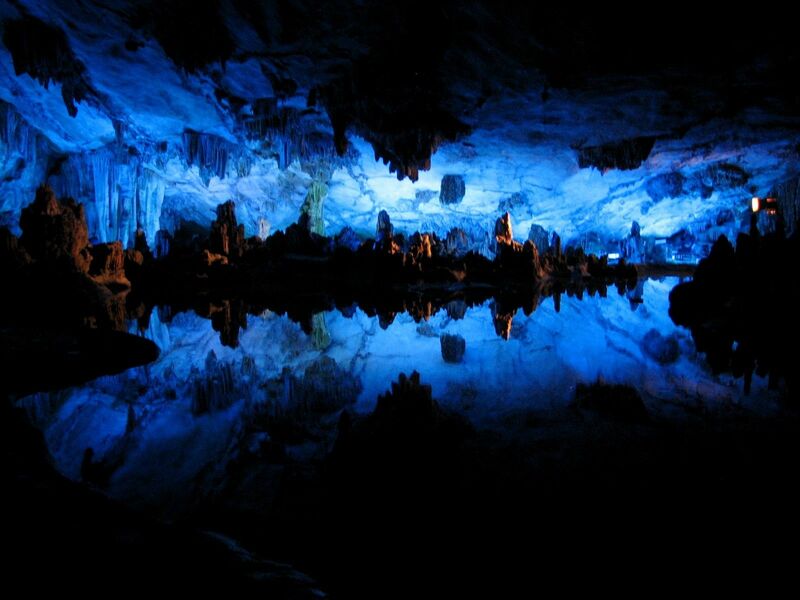 For those already having the air-tickets to Guilin in their pockets: The Reed Flute Cave is located on the southern shoulder of the Guangming Hill (Bright Hill), about 5 kilometers northwest of Guilin City.